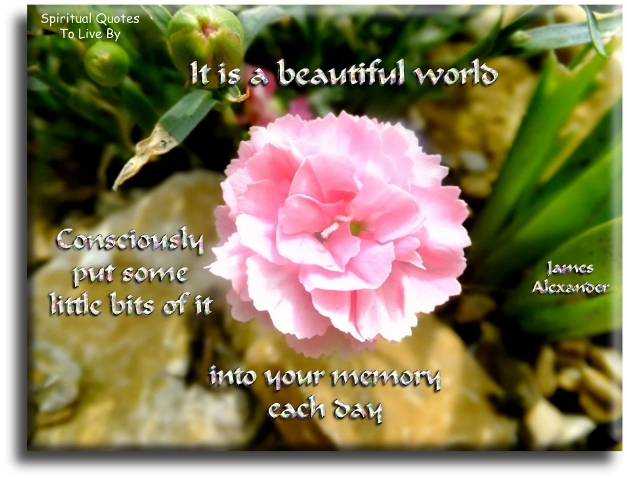 Universal Law of Attraction quotes are useful guidance to help understand the natural Law of Attraction to achieve an abundance of Love, Happiness, Joy, good Health and Wealth in your life. In the late 90's I began to read books that would talk about the fact that we create our own lives, I thought it was interesting but I obviously wasn't 'ready' to understand. In 2006 when looking for a good book to read on holiday, I was drawn to 'Ask And It Is Given' by Esther and Jerry Hicks. I read the book and I knew that this was really important to me, but it was to be a few more years before I was ready to begin to understand the teachings of Abraham and use their wisdom in my everyday life. We Are Source Energy In A Physical Body. 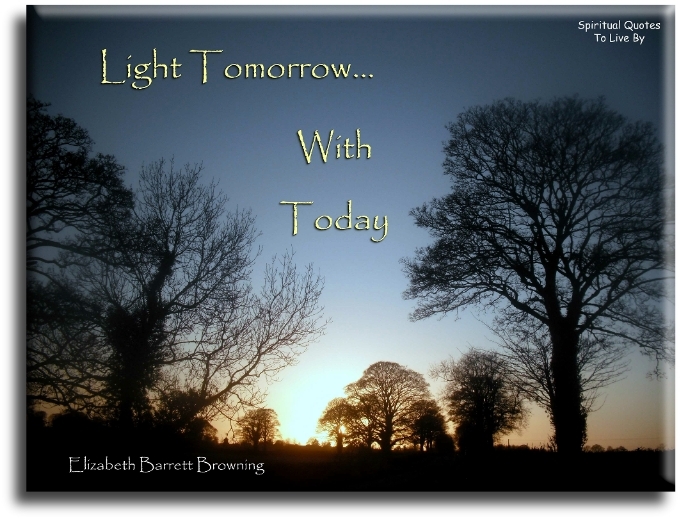 Everyday I now focus on what I have learned from Abraham Hicks and I am surrounded with Love, Joy and Beauty. Old ways of thinking can take time to change, so of course there are things that I still need to work on, but by keeping my focus on all the good in my life I know that it is only a matter of time before I manifest all those desires that I have in some way been resistant to change. The quotes on this page are all from sources or authors surnames beginning with A through to C.
Perception is consistent. What you see reflects your thinking. And your thinking but reflects your choice of what you want to see. Like attracts like. 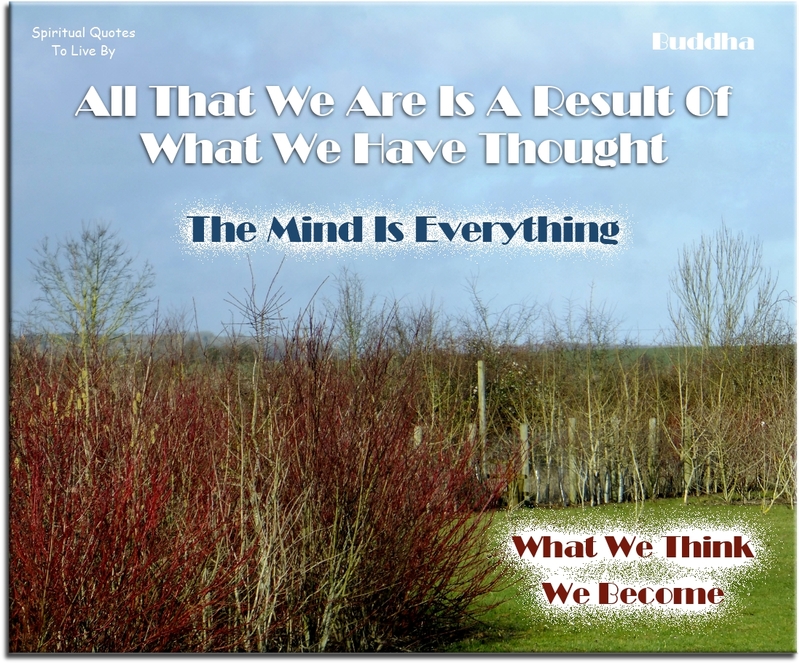 Whatever the conscious mind thinks and believes, the subconscious identically creates. You must weed your mind as you would weed your garden. In mindfulness, acceptance always comes first.. Change comes after. Your belief creates the fact. 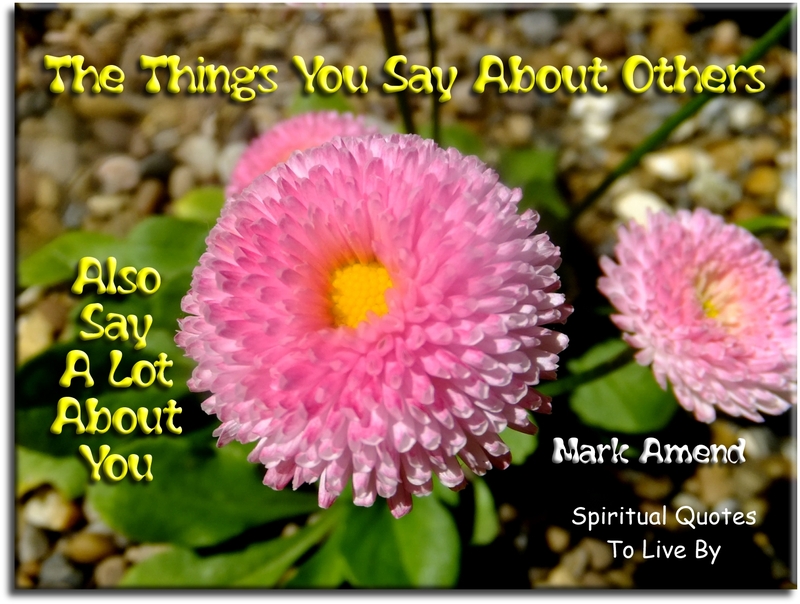 The things you say about others, also say a lot about you. Everything in the Universe has rhythm, everything dances. When you learn... Teach. When you get... Give. Men who do just and temperate acts are... just and temperate. Quality is not an act... it is a habit. We are what we repeatedly do. Excellence therefore is not an act, but a habit. We become brave by doing brave acts. 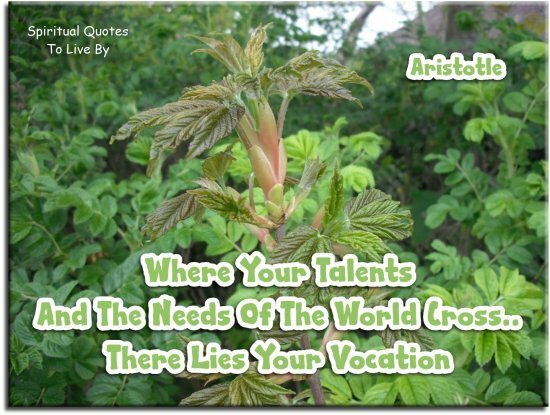 Where your talents and the needs of the world cross... there lies your vocation. Your work is not to drag the world kicking and screaming into a new awarenes. 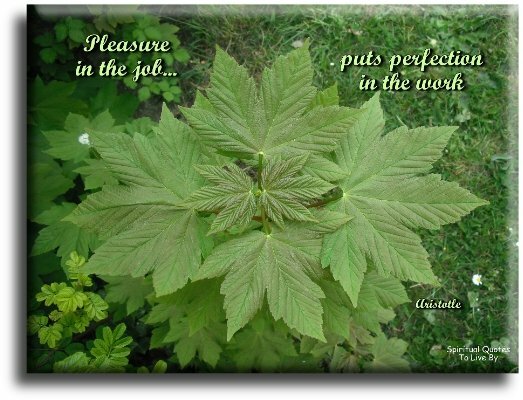 Your job is to simply do your work... Sacredly, Secretly and Silently. And those with 'Eyes to See' and 'Ears to Hear,' will respond. Many a prophecy, by the mere force of its being believed, is transmuted to fact. A man who uses his hands is a labourer. One who uses his hands and mind is a craftsman. But he who uses his hands, his mind and his heart is an artist. What we are looking for is... what is looking. Money is God in action. What you are able to think and perceive, defines the limitation of what you are able to achieve. As soon as you allow where you are to be alright, you will be able to get where you want to be much faster. Stop paying or buying into the ideas that don't resonate with the reality you prefer. Stop giving them credence. 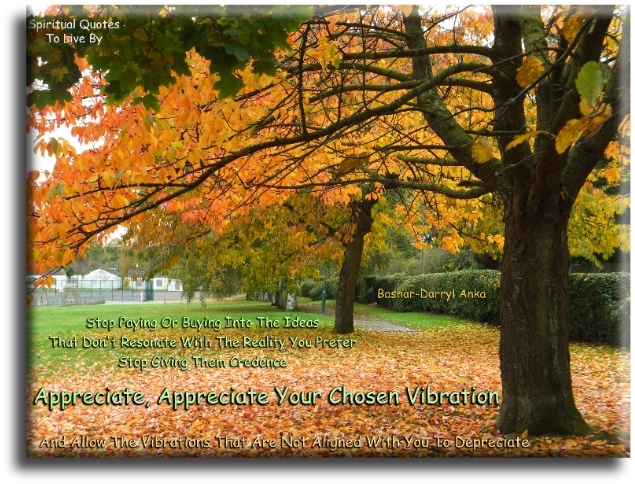 Appreciate, Appreciate your chosen vibration and allow the vibrations that are not aligned with you to de-preciate. You cannot perceive what you are not in the vibration of. He who sows courtesy, reaps friendship and he who sows kindness, gathers love. It has been proven now scientifically that, an affirmative thought is hundreds of times more powerful than a negative thought. Remember, it is not where you come from, or not even where you are, it is where you are going that matters most. Visualization is daydreaming, with a purpose. 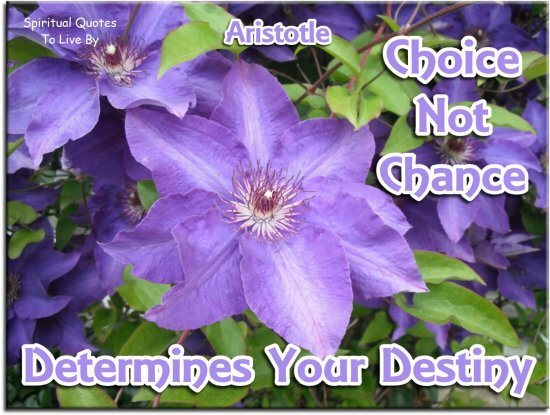 Experience is determined by yourself... not the circumstances of your life. 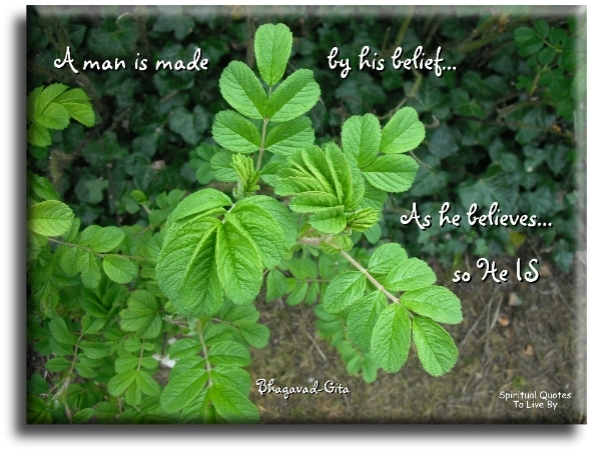 A man is made by his belief. As he believes, so he is. All things whatsoever ye pray and ask for, believe that ye have received them and ye shall receive them. Ask, and it shall be given you. Seek and ye shall find. Knock and it shall be opened unto you. For everyone that asketh, receiveth and he that seeketh, findeth and to him that knocketh, it shall be opened. Give, and it will be given to you, for by your standard of measure, it will be measured to you in return. What things so ever ye desire, when ye pray, believe that ye receive them and ye shall have them. Your heart is your paintbrush. The entire Universe is your canvas. Your life is your art. If you would learn the secret of right relations, look only for the divine in people and things, and leave all the rest to God. The Universal Presence, power and purpose is forever moving back of all things, in all things and through all things. 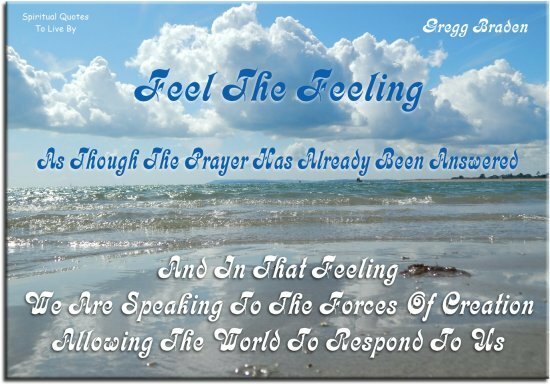 Feel the feeling as though the prayer has already been answered and in that feeling we are speaking to the Forces of Creation, allowing the world to respond to us. If you spot an opportunity and are really excited by it, throw yourself into it with everything you've got. Try to discover the road to success and you'll seek but never find, but blaze your own path and the road to success will trail right behind. We find things where we look for them. 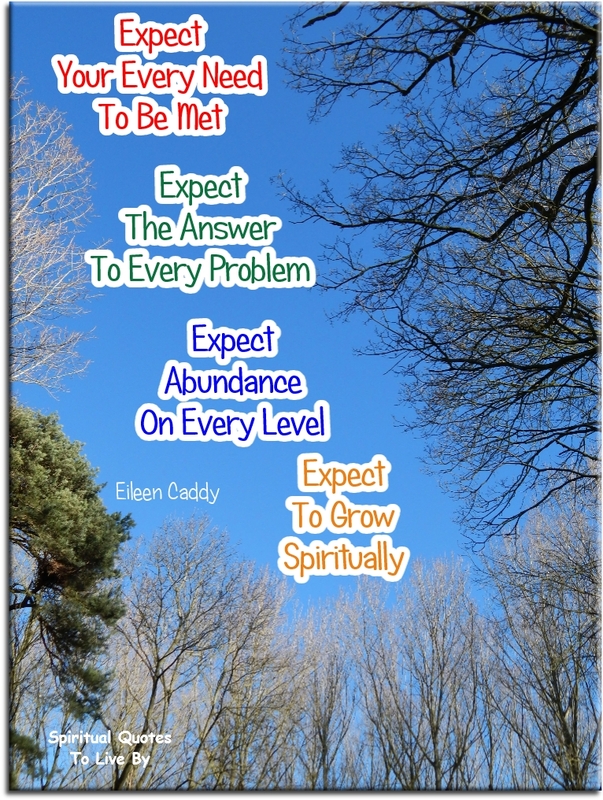 Create expectations to fulfil them. 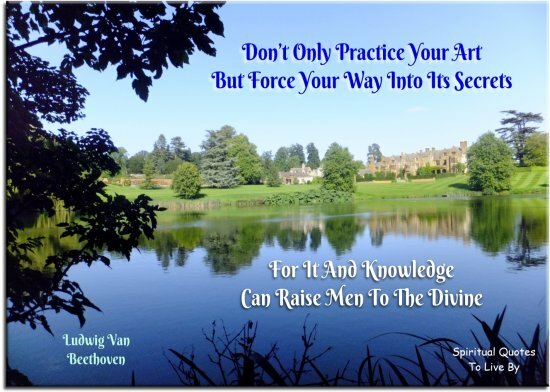 Practice the precept: find without seeking. Undoubtedly, we become what we envisage. Only take advice from people with lives you like. You are the sculptor of your own reality. Don't hand your tools to anyone else. When it comes to staying young... a mind-lift beats a face-lift any day. 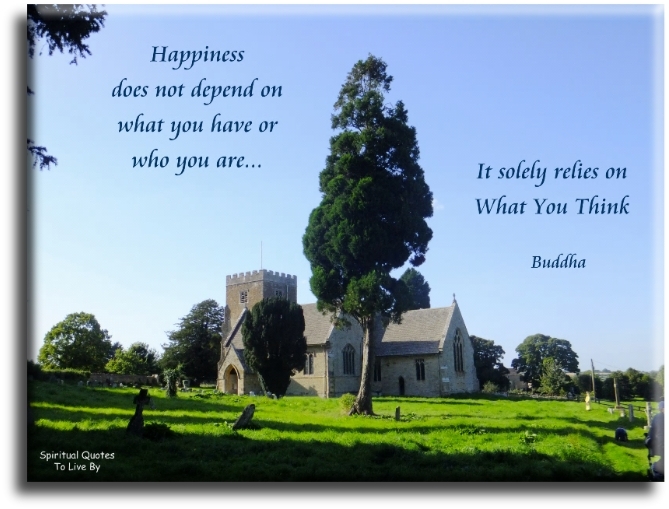 It solely relies on what you think. He is able... who thinks he is able. Holding on to anger is like grasping a hot coal with the intent of throwing it at someone else... YOU are the one who gets burned. born our of concern for all beings. What we are today, comes from our thoughts of yesterday. And our present thoughts, build our life of tomorrow. What you'll be is what you do now. When thou prayest, rather let thy heart be without words, than thy words without heart. At first people refuse to believe that a strange new thing can be done, then they begin to hope it can be done, then they see it can be done - then it is done and all the world wonders why it was not done centuries ago. What you have to do with your mind, when your body is miserable, is to make it think of something else. Happiness and love... are just a choice away. Prosperity is not just having things. It is the conciousness that attracts the things. Prosperity is a way of living and thinking and not just having money or things. Within you now and always is the unborn possibility of a limitless experience of inner stability and outer treasure, and yours is the privilege of giving birth to it, and you will, if you can believe. 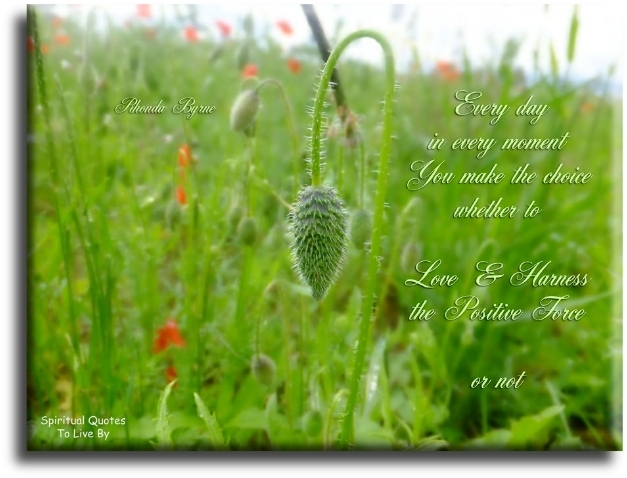 Every day in every moment, you make the choice whether to love and harness the positive force... or not. It doesn't matter whether your thoughts and feelings are good or bad, you are giving them out, and they will return to you as automatically and precisely as an echo returns the same words you send out. 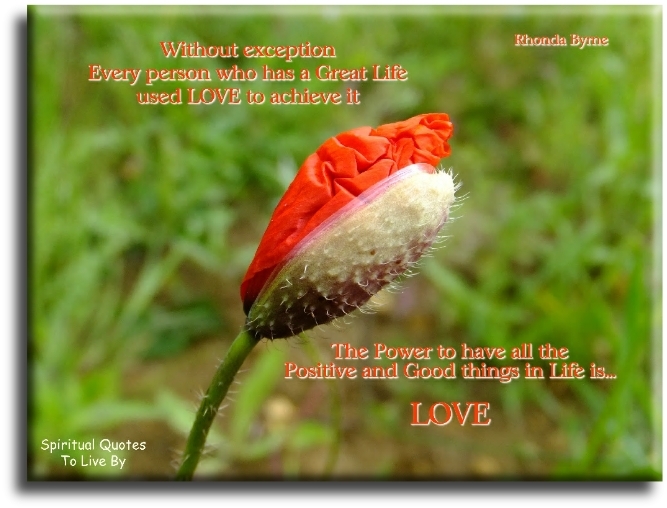 Love.... because when you love, you are using the greatest power in the Universe. Love is not weak, feeble or soft. Love is the positive force of life. Love is the cause of everything positive and good. People who have great lives think and talk about what they love more than what they don't love. And people who are struggling, think and talk about what they don't love more than what they do love. The more thankful you are, the more you attract things to be thankful for. You have to FEEL love to harness its power. Be very, very still, and allow every new experience to take place in your life without any resistance whatsoever. You do not have to do anything, you simply have to be and let things happen. Hold ever before you the vision of the new Heaven and new Earth. The secret of making something work in your lives is first of all the deep desire to make it work. 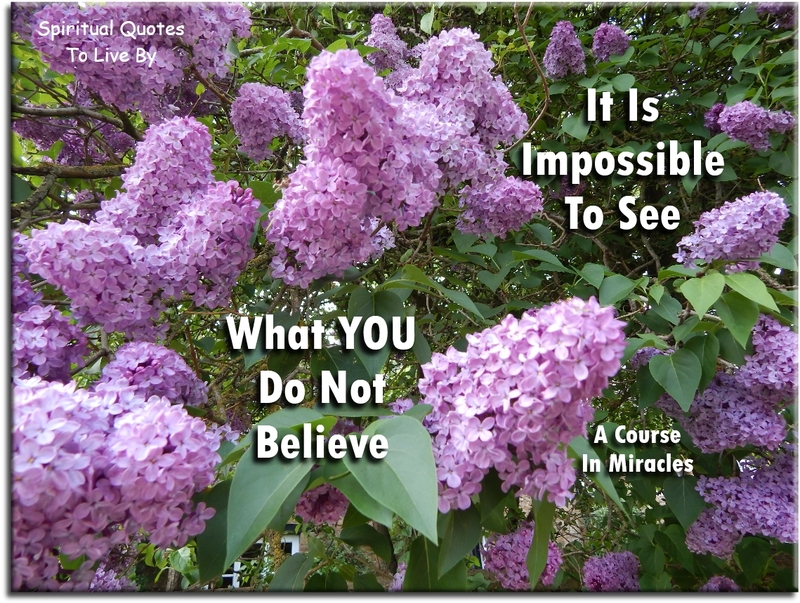 Then the faith and belief that it can work, then hold that clear definite vision in your consciousness and see it working out, step by step, without one thought of doubt or disbelief. 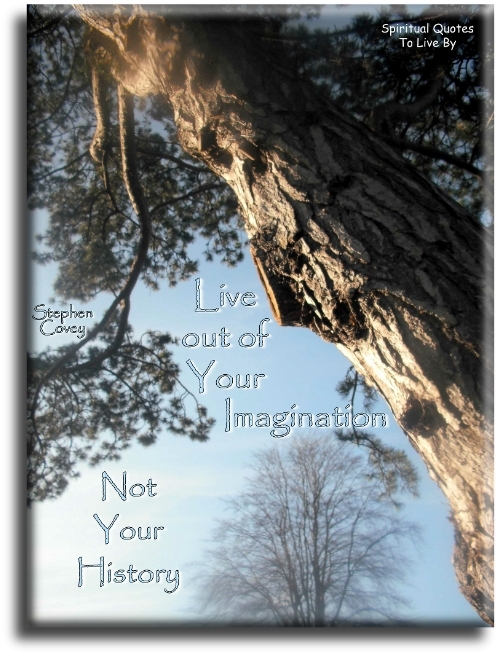 Imagination is a force that can actually manifest reality. I have seen blocks dissolved and lives transformed by the simple process of engaging the Great Creator in discovering and recovering our creative powers. And the Universe will open doors where there were only walls. It is the cause and affect of itself. It is evenly present in all places, at all times. Energy is in constant motion and never rests. It is forever moving from one form to another. If you want to find greater happiness and fulfillment in your life, you must begin to understand and live in harmony with the law of attraction. Act enthusiastic... and you will be enthusiastic. If you want to be happy, set a goal that commands your thoughts, liberates your energy, and inspires your hope. With your mind you have ability to form and transmit thought energy far beyond the norm. As far as I can tell, it’s just about letting the Universe know what you want and then working toward it while letting go of how it comes to pass. Every person’s every action has an effect. We live on a small, small planet, and what we do to others is what we do to ourselves. In the Universe there is an immeasurable, indescribable force which shamens call intent, and absolutely everything that exists in the entire cosmos is attached to intent by a connecting link. Intent is a force that exists in the Universe. When sorcerers (those who live of the Source) beckon intent, it comes to them and sets up the path for attainment. Which means that sorcerers always accomplish what they set out to do. 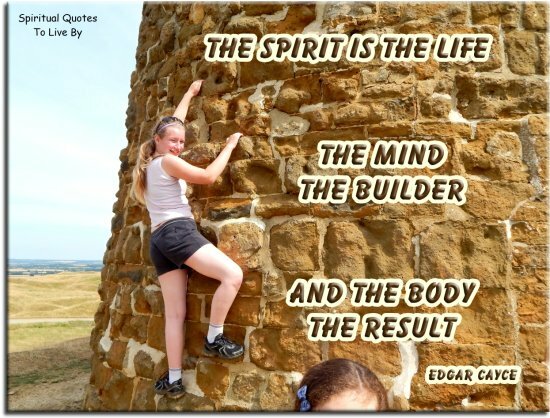 The spirit is the life, the mind the builder and the body the result. It's our duty as men and women to proceed as though the limits to our abilities do not exist. We are collaborators in creation... the future of the earth is in our hands. 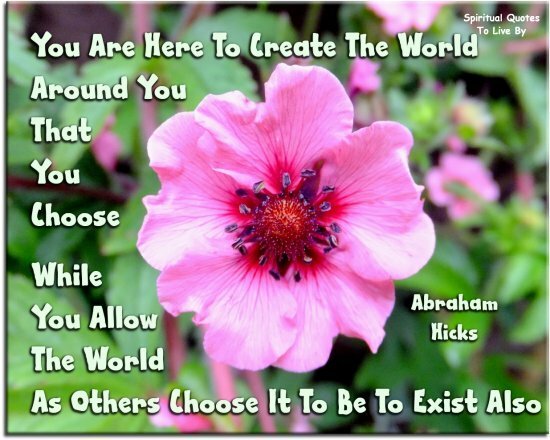 Realize that now, in this moment of time, you are creating. You are creating your next moment based on what you are feeling and thinking. That is what's real. It is never too late to begin creating the bodies we want, instead of the ones we mistakenly assume we are stuck with. 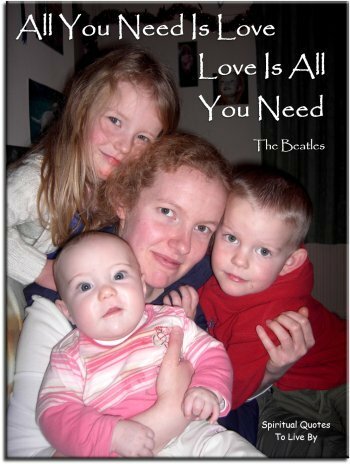 Love is what we are in our essence, and the more love we feel in our hearts, the more it will be brought to us. Love takes many forms... It is up to you to choose which you wish to express. One of the unique things about the human brain is that it can do only what it thinks it can do. The minute you say 'my memory isn't what it used to be' or 'I can't remember a thing today.' You are actually training your brain to live up to your diminished expectations. Synchronicity is choreographed by a great, pervasive intelligence that lies at the heart of nature, and is manifest in each of us through intuitive knowledge. When you expand your awareness, seemingly random events will be seen to fit into a larger purpose. When you give, you reveal a spiritual truth... that the flow of life never runs dry. If you become the example, it will reflect and other people will get it around you. Send your intention out every day, every moment, that if something comes your way that you're not happy about, send an intention to change that situation; it will create a sphere of energy, of conscious energy, which is happening all around the world. We have the ability to create reality, to bring it forth, to call it forth. It is time for us to step into our power as a planetary race. 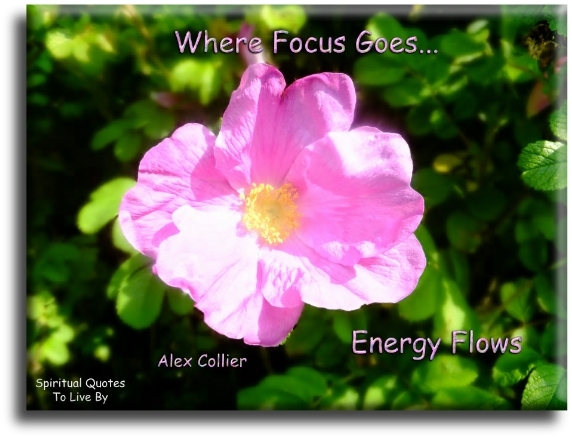 Where focus goes... energy flows. 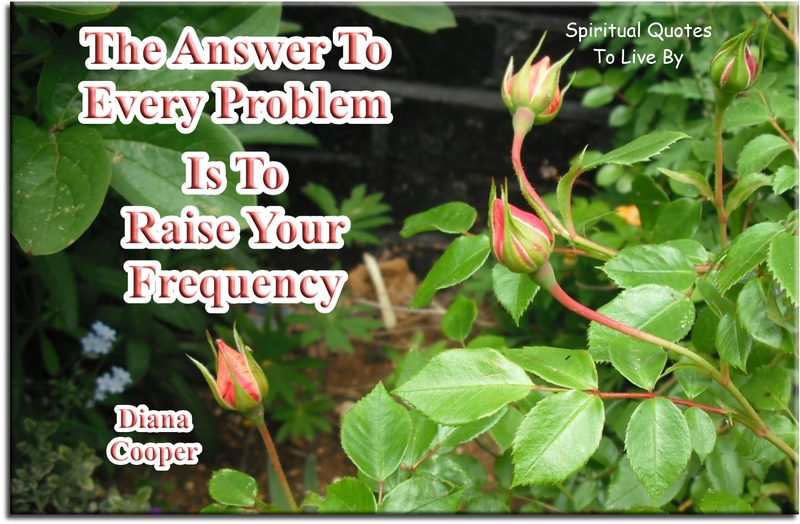 The answer to every problem is... to raise your frequency. Where there is no love, pour in love and you will draw out love. That which you give your energy and your emotion to becomes your reality. Whatever you give your emotion to becomes reality for you. The magic begins in you. Feel your own energy and realize similar energy exists within the Earth, stones, plants, water, wind, fire, colours and animals.